Well, I am really excited to be able to present to you my first interview: Barbara Winter, best-selling author and creative entrepreneur extraordinaire. I am always fascinated by people who manage to combine their artistic and creative talents with being a successful entrepreneur. In the end that’s what I am aspiring to achieve. I first met Barbara in a seminar in Toronto and I enjoyed her humorous, casual yet informative style. A few phone conversations and a tele-class later: here she is! 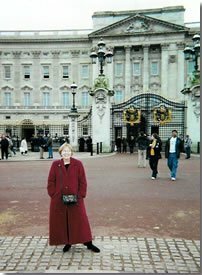 Barbara in front of Buckingham Palace. 1. Please tell us a bit about your background and work experience. I’ve been self-employed for 30 years so the things I did prior to that seem very much in the distant past. My first job was as a high school English and speech teacher. Then I worked for the State of Minnesota Employment service. After taking three years off to be a fulltime mother, I was an interior designer with Ethan Allen. Every one of those jobs taught me things that helped me when I started my own business–including teaching me that I never wanted to work for anyone but myself. 2. You are one of the pioneers of self-employment. When and why did you decide to become self-employed? What was it like when you got started? How have things changed since then? I certainly wasn’t encouraged to be self-employed when I was growing up. The decision evolved gradually. I had gotten interested in personal growth and development back in the early seventies and was slightly frustrated that all the books and seminars (which were far fewer than there are today) were by men, for men. I decided to take some of the things I’d learned and do seminars for women. I also began publishing a newsletter called The Successful Woman. It was all trial and error. There was very little information to help me then. I began working from home, but was somewhat embarrassed about that. I had no idea that I was going to be part of the home business revolution. Essentially, it’s so much easier now to be self-employed because there are more of us doing it and there’s more good information. 3. One of the primary focuses of this website is travel. Tell us about your “Support Your Wanderlust” seminars. Well, I’ve always had wanderlust myself and as I got more confident about being self-employed I knew I wanted my business to include travel. As time went on, students in Making a Living Without a Job seminars kept telling me that they wanted to travel so How To Support Your Wanderlust came out of those requests–and my own and other entrepreneur’s experiences creating profitable travel for themselves. 4. How do you integrate travel into your entrepreneurial ventures? What opportunities of travel have you been able to enjoy through your business endeavours? I travel extensively throughout the US doing seminars. Now that I’ve joined forces with Nick Williams, who lives in London, we’re doing more work together in the UK, as well as in the US. As a writer, I’ve also traveled and incorporated research into those trips adding another profit center– and tax deductible travel. 5. How often do you travel and how do you reconcile travel with all your various business endeavours? It varies, but I’ve kind of developed a system that works for me. The seminars I do in adult ed programs are primarily held on Friday evenings and Saturdays so I travel on the weekends with those. When I’m in Europe, I have to have my writing projects done before I leave. I’ve always preferred to travel more frequently, but for shorter periods of time so that makes it possible to keep up with the demands of my business at home because I’m usually not away for long, long periods of time. And I only buy houseplants that can survive without me.